We strive to educate the public about safety and appropriate use of our wilderness. 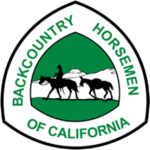 We are concerned men and women dedicated to the gentle use of California trails and back country. Catch up with our planned events by viewing our Events Calendar. 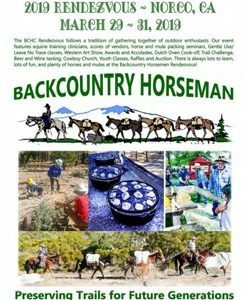 Featuring Equine Training Clinicians, vendors, seminars. 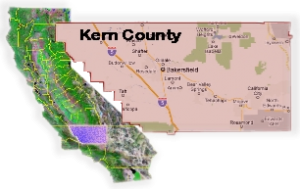 On April 2nd a presentation was held at the Frazier Park Library to highlight some of the obstacles facing stock users. The well attended event was coordinated by the local newspaper, The Mountain Enterprise, and consisted of three segments. The event lasted over 2 hours and afterwards the presenters met with the audience to answer questions and go into more detail regarding the various topics. The event helped educate the audience on the importance and benefits of the BCHC. The sun was shining, the sky was blue; what more could one ask for? It’s a new year and as your new President I would like to start by congratulating Kathy Ervin as our new Vice President and welcoming our new Director Brian Reese to the Board. In our first Board meeting January 7th we got right down to business and set our calendar for the year. We voted to send $500 to support the One Spade Youth Packers. 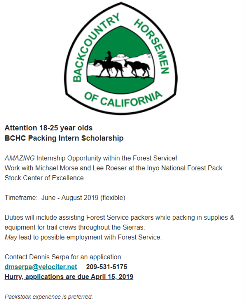 If you are not familiar with this program check them out at www.onespadeyouthpackers.org/ We also voted to send $500 to the BCHC internship program and $500 to the BCHC California Wildfire relief fund on behalf of the Kern Sierra Unit. These funds were available thru fundraising by this unit in the form of Rides and Raffles. Keep that in mind when we have our next fundraiser.